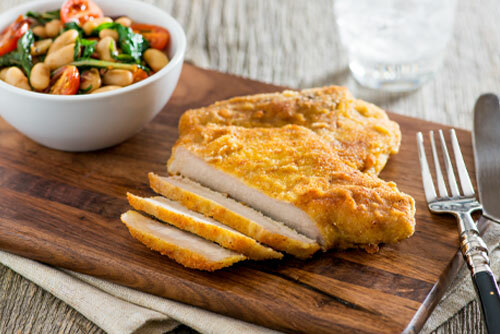 Milanese Pork Chops: Toss the breadcrumbs with the Parmesan cheese; set aside. Season pork chops all over with salt and pepper. Coat each chop first in flour, then dip in beaten eggs and coat with breadcrumb mixture. Heat oil in a large nonstick skillet set over medium heat. Cook pork chops, for 4 to 5 minutes per side or until golden brown. Preheat oven to 375°F. Bake chops for about 5 minutes or until cooked through. Serve with Warm Dandelion Greens and White Bean Salad. Add dandelion greens to boiling salted water for 30 to 60 seconds or until they start to wilt. Drain well, cool and squeeze out excess moisture. Toss grape tomatoes with sundried tomatoes, balsamic vinegar and salt; set aside. Heat olive oil in a large skillet set over medium-high heat. Add garlic, rosemary and hot pepper flakes (if using). Cook, stirring, for 1 minute or until garlic softens and fragrant. Stir in beans. Cook for 3 to 5 minutes or until heated through. Add dandelion greens and grape tomato mixture; sauté for 1 to 2 minutes or until grape tomatoes are warmed but keep their shape. Blanching the dandelion greens removes some of their bitterness.